See what I did there? No? You will. My mom came out to visit (and escape the interminable Montana winter) in late March. We had lots of adventures and general shenanigans. As someone who gets up even earlier than I do (an impossible feat according to TD), she spent some quality time perusing my little cookbook collection. One of the recipes she pulled was for a gateau Basque out of Dorie Greenspan’s Around My French Table. Sadly, this was during our “oven transition” and so my mom had to wait until her return to the Big Sky to try out this cookie-cake-pie recipe. “You’ve got to make this” she said some weeks later. “Sure mom, okay” was my reply and then, like most negligent children, I immediately forgot. 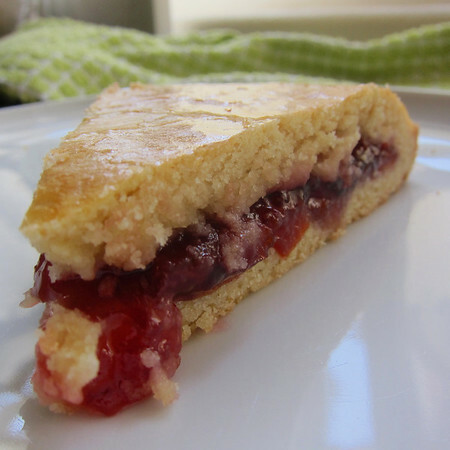 “Did you try out the sour cherry tart?” was her question the next time we spoke. “Err…uhm…just waiting for the new oven to be installed,” my excuse. And so it came to pass that after a batch of French macarons and some chocolate chip cookies for TD, gateau Basque was the third item baked in the oven. Have I ever mentioned that while probably the nicest lady on the planet, my mom is also the most evil? This is a good example. Under the pretext of encouraging baking experimentation, she bullied me into bringing this…this…temptation into my house. Don’t let its simplicity fool you like it did me. I got all the way to photographing this disk of sin without tasting its rich–soft–toothsome–tartness. People find this hard to believe, but I generally am not all that interested in eating the things I make. Baking and cooking for me is about short-term gratification in the creation and experimentation categories. But in this case? I was like Eve to the apple (or whatever you’d like to argue the parable referred to). One bite. And then another. And, before I knew it, I’d eaten the entire wedge and found myself eyeing the remaining six (TD ate one too). While significantly more sophisticated and elegant, there is also something about the gateau Basque that reminds me of the Hostess pies my brother and I coveted as children. Which I think got me thinking this would be a perfect picnic dessert. Transport it uncut and then serve up the wedges to be eaten by hand. Original sin and evil parents aside, according to Dorie, this is the pastry in the Pays Basque region of France (and probably Spain). There is even a museum dedicated to it (do I hear research junket?). As if this lovely pastry isn’t enough to create drool-worthy geography, you can visit the region virtually through my talented friend Ann Mah. While it is traditionally made with sour cherry jam (I found mine at Trader Joes) or pastry cream, I think it would be fantastic with everything from lemon curd to Nutella (which would certainly elevate this seductress from Old Testament to Dante’s Inferno). A design note. The top of the tart is traditionally etched with two interlocking scroll, or “S” designs. Since Dorie said she likes a cross-hatch pattern, I tried that. Sadly I did not make the pattern deep enough and it baked out. I guess this means I’ll have to try again. Darn. 10 TBS (1 1/4 sticks) unsalted butter at room temp. In the bowl of a stand mixer fitted with a paddle (or hand mixer), beat the butter and sugars together on medium for about 3 minutes. Add the egg, beat for another 2 minutes scraping down the sides of the bowl as needed. The mixture may look curdled and that’s okay. Reduce mixer to low, add-in vanilla. Then add-in dry ingredients in 2-3 additions mixing in between until just combined. Place a large sheet of plastic wrap, wax paper or parchment on your work surface. Put half of the dough (it will be sticky) in the middle and shape into a disk (get it as round and flat as possible…maybe…4-5 inches). Repeat with second half of dough. Refrigerate for at least 3 hours (overnight is always good). Preheat oven to 350 degrees. Generously butter an 8X2 round cake pan. Remove rounds of dough from fridge and let them rest for a couple of minutes. Then, roll each out into an 8 inch rounds (to avoid adding flour, I like to layer the dough between sheets of parchment and then roll). If the dough breaks or cracks, not to worry, just piece it back together like you would pie dough. Fit one round into the bottom of the dough. If it rides up the sides a little, this is good and will help to seal the top layer. Spoon 3/4 C of your preferred filling onto dough. Start at the center and spread until you have about a 1-inch margin. 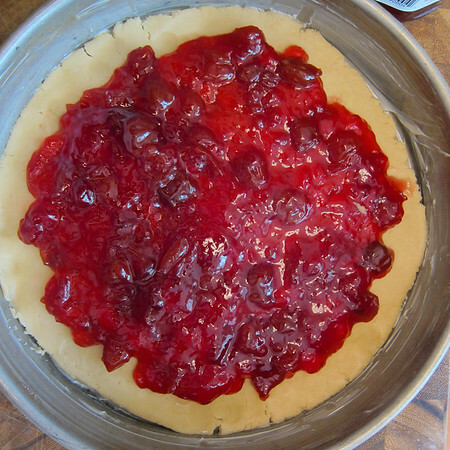 Moisten the bare ring of dough (around the jam) with water. 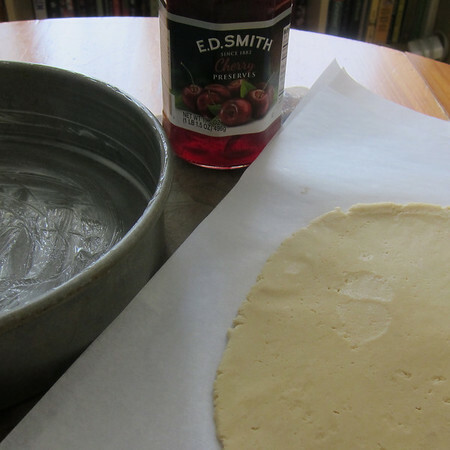 Add the second piece of dough, pressing around the edges to seal it. Dorie says that no matter how tightly you press the dough, a little of the filling is bound to escape during baking. This will give your gateau some character. Brush the top of the dough with egg wash. Using the tines of a fork or a sharp pairing knife etch a cross-hatch pattern into the top (in the one pictured above I did not press deeply enough and the patten baked-out). Bake for 40-45 minutes or until the top is golden brown. Transfer to a cooling rack, let cool for 5 minutes. Carefully run a blunt (dinner) knife around the edge of the cake. Turn the cake over onto the cooling rack and then quickly flip it right-side-up so that it can cool to room temp. I think this is best enjoyed within the first day or two. 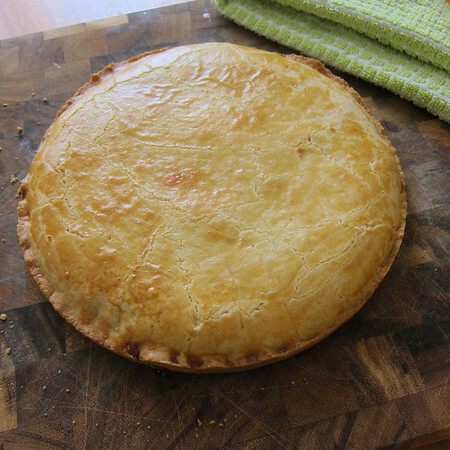 While the taste isn’t compromised, the pastry looses some of its crispness the next day. Beautiful! I’ve been lucky enough to eat Gâteau Basque in Pays Basque. My favorite was a miniature version. This post inspired me to reread my blog post about the trip (http://annmah.net/2012/05/29/pays-basque/) — I wonder if a touch of cornmeal would be a nice addition to the pastry? Ann–I edited this post just a touch to heighten the Basque experience directly through your link :). I love the idea of adding a bit of cornmeal. 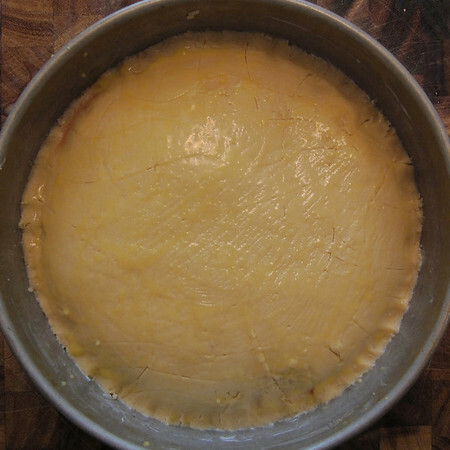 In addition to adding some satisfying texture it might also extend the shelf life a day or two on the tart. And really, baby gateau Basques…definitely in my baking future. Previous Previous post: Alfa who?